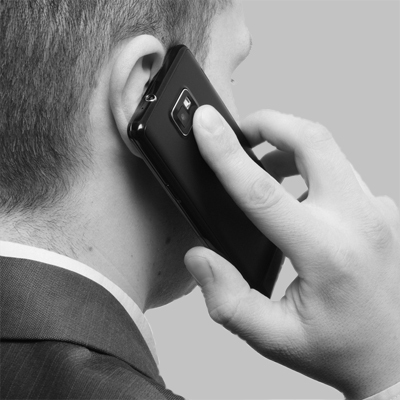 Whenever your cell phone is turned on, it is emitting potentially harmful EMFs. Possible side effects can range from disrupted sleep patterns to changes in DNA. Most people cannot function without their cell phone. But you can protect yourself against the danger. When you hold your cell phone up to your ear, 10% to 80% of the radiation from the phone penetrates two inches into your brain. In children, the penetration is even deeper. Studies have shown that cell phones held near the head cause brain wave changes in 70% of people. The potential danger is so widely accepted that insurance companies are beginning to exclude coverage for injuries related to wireless phone radiation exposure. Earphones, headsets and speaker modes provide distance, but they don’t eliminate danger. Anytime the power is turned on, cell phones emit electromagnetic radiation – even in stand-by mode and regardless if carried on belts, in pockets or purses—or set on the table in front of you. Cellphones emit two kinds of EMFs – microwave electromagnetic radiation from the antenna, and more EMFs from the phone body. Both are harmful. 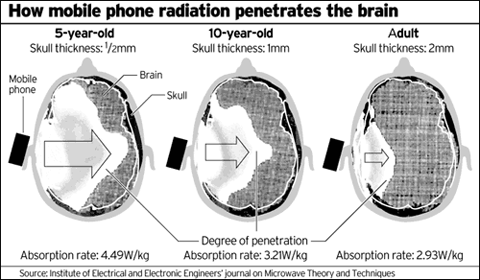 20-80% of the radiation from a phone’s antenna penetrates up to two inches into the adult brain. Studies have shown that people who sleep with a cellphone by the bed have poor REM sleep, leading to impaired learning and memory. Long-term effects remain to be seen. When the cellphone signal is held next to the head, brainwaves are altered a full 70% of the time. Many insurance companies are so alarmed by the evidence that they now exclude health issues related to cell phone radiation from coverage. Most brain surgeons limit their cellphone use, and counsel patients never to hold them to their ears.